Our platform has been live for almost two years now and we’ve grown a lot since launching our German beta in October 2017. We launched Spanish last year and we’ll add two more languages this Spring. 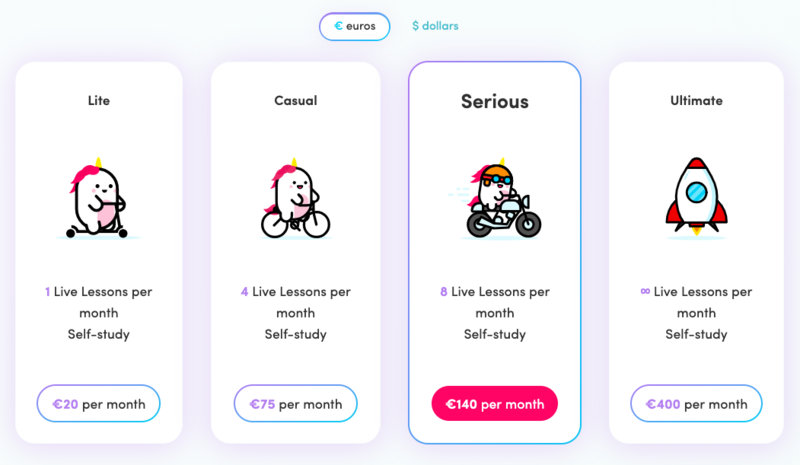 We also built a number of new features to make studying easier and fun, but most importantly, we’ve seen some of you early adopters go from beginner level German to successfully passing official B1 exams with us. Witnessing your achievements are by far our proudest moments and the best indicator of our product’s maturity. That’s why we’re finally moving away from our beta prices and introducing a new pricing structure that better reflects the state of our product today. The new subscription plans and prices will kick in on April 15th, 2019. What happens to users who subscribed before April 15? We will grandfather all users who subscribed before April 15th, meaning the new pricing won’t affect you. As early adopters of Chatterbug, your constant feedback and encouragements have been invaluable in shaping our product. That’s why, as long as you remain on your current plan, we guarantee that your subscription will be preserved at the old price. Case in point: let’s say Julie subscribed to Chatterbug’s Serious plan on April 1st. If she remains on the Serious plan, her subscription will cost €80/$95 a month even after the pricing change on April 15th. However, if Julie unsubscribes on April 30th and decides to resubscribe later in May, she will fall under the new price structure and be made to choose one of the new subscription plans. If you’ve always wanted to try out Chatterbug’s more expensive plans, this is your chance. Upgrade before April 15th and benefit from our old pricing. All of us at Chatterbug are devoted to make the pricing change as transparent and easy as possible for all of you. So, if you have any questions or concerns about the incoming changes, write to us via chat or at hello@chatterbug.com. Can I take Live Lessons on mobile? Can I re-take the placement test?